We’re moving into an ‘A.I.-first’ world — Sundar Pichai, Google’s CEO. Conversational AI will plausibly supersede every other up and coming technology within the next few years. Conversational AI is an impending surge to be witnessed as industries rapidly invest in AI to conceive efficient services in an attempt to improve engagement with their customer base, as well as to improve operations holistically, while profusely reducing costs. Conversational AI is a significant leap forward and has found tremendous success with consumers embracing mellifluous speech-technologies such as Siri, Alexa and Google Assistant. It is a telling fact that sales of Amazon Echo in its first year were comparable to that of the first iPhone, and I believe the technology will prove even more transnational. Companies are fast catching on the imperative improvements in conversational AI , and its exponentially growing ability to decipher natural languages — AI chatbots and other AI conversational interfaces are already rendering human like conversations in several native languages across different countries. We see successful instances of conversational AI delivered by companies as products and services. By 2020, 40% of all mobile interactions will be via Virtual Assistants. There are apparent aspects of conversational AI that warrant its imminent omnipresence across industries for improved operations and customer experience, as well as in IoT devices and appliances. Apart from rendering human-like conversations and staying active 24*7, their ability to be trained in several languages is indeed awe eliciting. It is important to acknowledge that only 7.5 percent of the world’s population identifies as native English speakers. Ability to speak multiple languages is one of the key reasons why chatbots and other speech and text interfaces will be able to amass a wider audience and create empathy with them. However, it wouldn’t go amiss to pay attention to the fact that effective communication in multiple languages requires cultural awareness and assimilating nuances and linguistic syntax. There’s tedious amounts of work involved in building a bot that communicates effectively in multiple languages. Platform Agnosticism — Easily deployed across platforms. Success of customer-facing companies is commensurate with their ability to rapidly build AI technologies to help customers interact with their service providers and businesses through a communication platform of their choice. AI chatbots, the most prevalent instance of conversational AI, are capable of being deployed across most, if not all platforms, prove the ease of engaging with chatbots instantaneously. Voice assistants and chatbots for businesses can easily integrate into native applications for businesses and their web platforms making customer experiences more fruitful and effective. For the users, engaging with their service providers has been as easy as communicating from there favourite chat platforms and apps like Facebook and WhatsApp— As of May, 2018, Facebook had been used to create more than 300,000 bots already. The online audience has now expectations high when it comes to customer experience and support. Sales, especially in the sector of e-commerce , is directly influenced by instantaneous responses and perpetual availability. Fortunately, chatbots are allaying the gap between the need for constant engagement and the inconsistent services and unavailability by being deployed across channels and serving round-the-clock. 77% users believe that immediate online help would increase likelihood of completing transactions online more often. 85% of businesses believe that immediate online help would improve online sales conversion rates. The momentous strides made in Natural Language understanding and Artificial Intelligence (AI) are engendering digital technologies to achieve the very same through virtual assistants that are AI chatbots. Being of assistance 24*7 and being able to instantaneously engage customers to drive sales, the bots have found a niche’ in the digital market. Re-envisioning Customer Experience: AI bots will give a voice to business. Engaging customers with personalized marketing. Digital technology will finally become intuitive, helping address digital exclusion and providing new ways for brands to build engaging relationships with their customer-base. These AI bots are also capable of emulating a tone that is specific to a particular business and can truly become a voice of that business, and in native languages. No longer will exist a linguistic barrier as this technology will be able to converse in hundreds of languages. 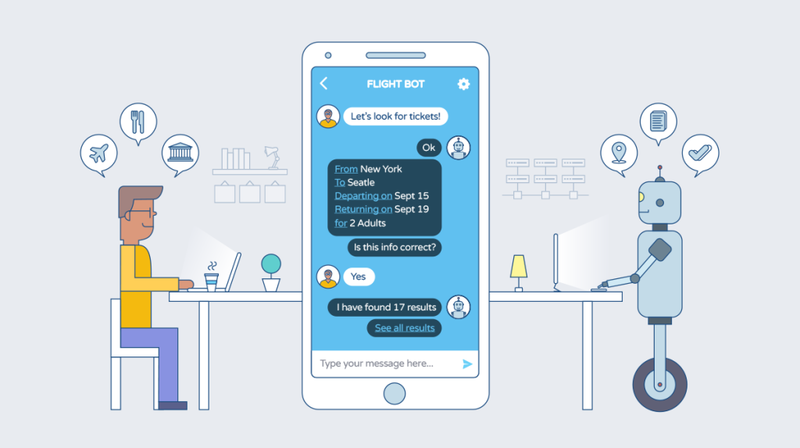 Capable of delivering a personalized user experience and recommendations, and making the conversations interactive through building a meticulously trained intuition, these bots are proving transformative. From driving sales and recycling leads through automation, to employing data analytics to target customers to push sales, the bots are manifesting a holistic environment for businesses to interact with their customers and vice-versa. Read how chatbots are ideal for personalization. Instead of having a traditional point-blank solutions approach, conversational AI can easily integrate into the existing systems and revel in the environment, connecting with their existing communication channels and enterprise CRM systems. This is non-disruptive to the current frameworks of business and will not force a revamp to accommodate the essential technology, thus also proving to be economically feasible.